Thousands of London firefighters are to start voting on whether to take industrial action in a row over new contracts. The dispute centres on plans to scrap current working hours and force fire crews to sign new contracts. 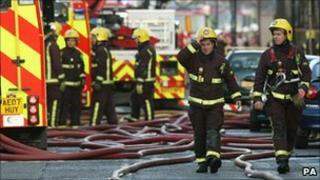 The London Fire Brigade Union said it will ballot about 6,000 members in the capital on action short of a strike. The London Fire Brigade described the ballot as "totally unnecessary" and said it hoped action would be averted. The brigade announced earlier this month it was starting consultations on terminating existing employment contracts and re-engaging firefighters on new start and finishing times to shifts. Matt Wrack, the FBU's general secretary, said: "It's a great shame that London firefighters have to consider industrial action, but they won't tolerate attempts to threaten or intimidate them. "The proposal to end the contracts of all London firefighters is the most disgraceful thing I have ever seen in the fire service." He added: "The people who are taking these decisions about cutting the service and reducing night-time fire cover in London have not the first idea what firefighting is all about." London Fire Brigade Commissioner Ron Dobson said: "This is totally unnecessary. "These changes are about doing all that we possibly can with existing resources to make Londoners safe." He added: "It is hoped that talks will result in a conclusion to this long-term issue that will avoid the need to terminate current contracts or for any form of industrial action." The ballot result is due on 17 September, with any action likely to start from 24 September.